We offer a wide range of opportunities for anyone who is interested in working on the frontline of the capital’s ambulance service. Our first level of training will qualify you to work as an Emergency Ambulance Crew member. Your career opportunities don’t end there. Become an operational manager and you will have a key role managing our day-to-day service and influencing decisions about our future. If you’ve got an interest in patient care, you don’t have to have a medical background. We can provide you with all the training you’ll need, and make sure you have the opportunity to get out on the road as soon as possible, under the guidance of our qualified staff. And the salaries are good too. 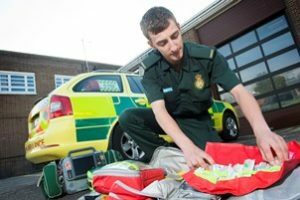 You can expect to earn more than £29,000 as a qualified paramedic, with further increases as you take on more training and responsibility. For more details about how to join us as an Emergency Ambulance Crew member, contact our recruitment team.